Cold weather in Baghdad is not an excuse to miss the ravishing-hot sounds of ‘Ritmo Latino’ (Latin Rhythm) ensemble, as it performed in front of eager spectators at the Division Morale, Welfare and Recreation tent, Jan.17. 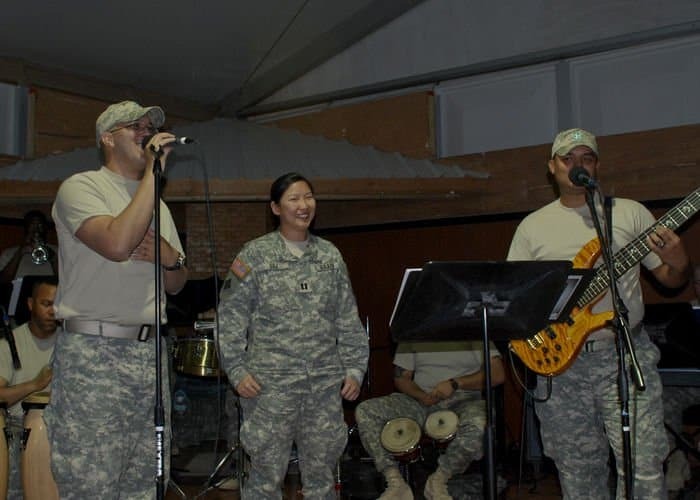 The group is part of the various musical ensembles that comprise the 4th Infantry Division Band, each one with a different musical style, but all with the same mission. ‘Ritmo Latino’ ensemble musicians are from Texas, Alabama, Mississippi, Georgia and places as far away as Bolivia and Puerto Rico, all of them are members of the 4th Infantry Division Band. Spc. Ellington Zimmerman, a Dothan, Ala. native, performs a solo in the timbales drums during the performance of the ‘Ritmo Latino’ ensemble at the Division Morale, Welfare and Recreation tent, Jan. 17. 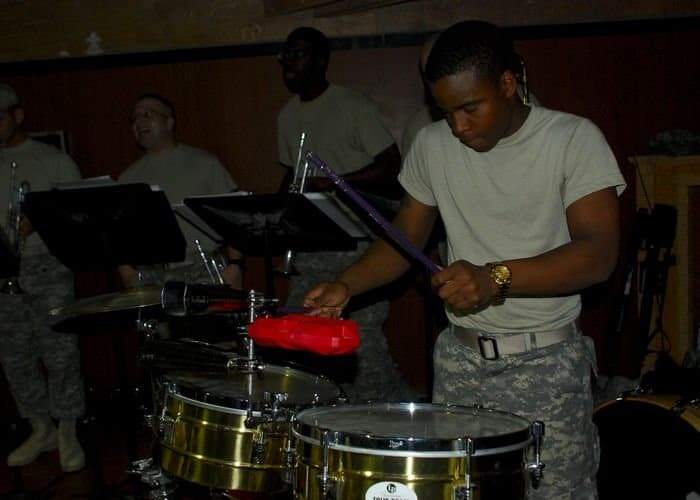 ‘Ritmo Latino’ is part of the 4th Infantry Division Band and plays the Caribbean rhythms of Salsa, Merengue, Bachata and Reggaeton. 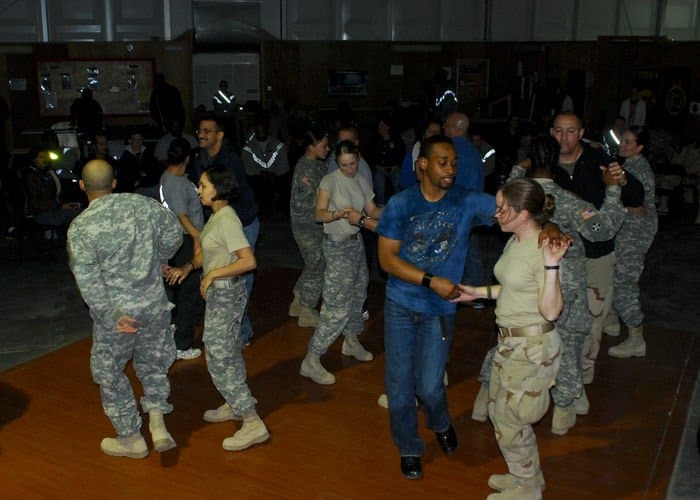 For a little more than two hours the crowd was delighted in listening at the swing of Merengue, Salsa, Bachata and Reaggeton, strange musical terms in the English dictionary, that gave the audience the opportunity to travel to far away places without leaving Iraq. “Experiences like this one are special because it helps to bond Soldiers, Marines, Airmen, Sailors and civilians in a special way. It really is an important morale event for every one,” said Air Force Capt. Hallie Day, a Lancaster, Calif., native and currently with Multi-National Force-Iraq. Music doesn’t have race, language or religious preference so for the members of the 4th Inf. Div. Band ‘Ritmo Latino’ ensemble the purpose of bringing a little joy to every one is worth the effort. Military Friends of NewsBlaze originated these stories, sending them directly to us from Iraq, some from Afghanistan and some in the USA.